Todd’s alarm on his tablet went off at 10, I think. We decided that we’d take a break from the touring and get caught up on some sleep. I threw open the curtains when I woke up and it was still dark out. One of the (thousands) of things that amazed me on this trip was how infrequently I felt hungry. I am a big eater. As I am writing this blog entry I am eating a grilled cheese sandwich and a piece of chocolate cookie with frosting on it, for example. But this business of short daylight and time changes had me never feeling hungry. Or maybe I was never hungry because I was mainlining hot chocolate at every turn. In the lobby of the hotel there was a carafe of it with cookies available anytime I wanted it. I pretty much grabbed a cup and a cookie on my way in and on my way out. As the sun was coming up we headed into City Center for lunch at a Scandinavian restaurant, then we poked around in the shops to buy gifts. We bought some Icelandic wool sweaters, a throw blanket, last minute Christmas gifts and the like. 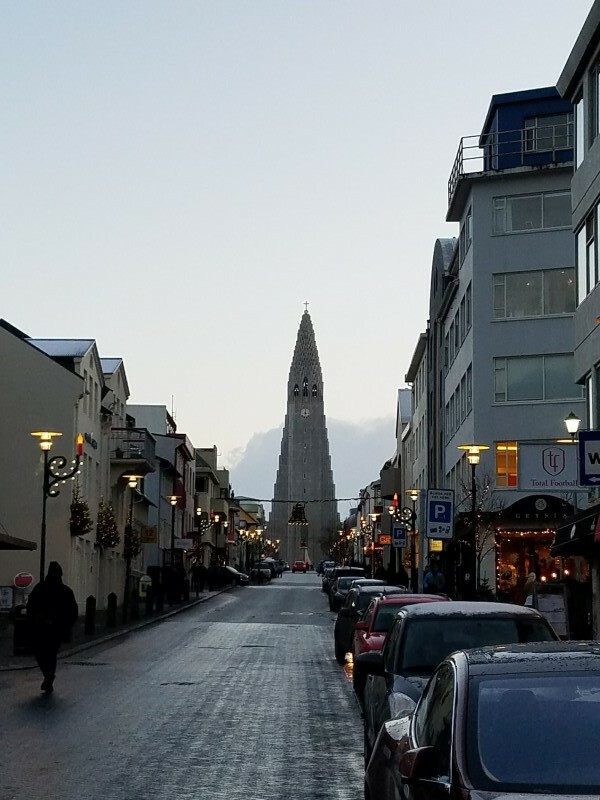 This church at the end of the street was inspired by the lava columns we saw the day before at Vik. 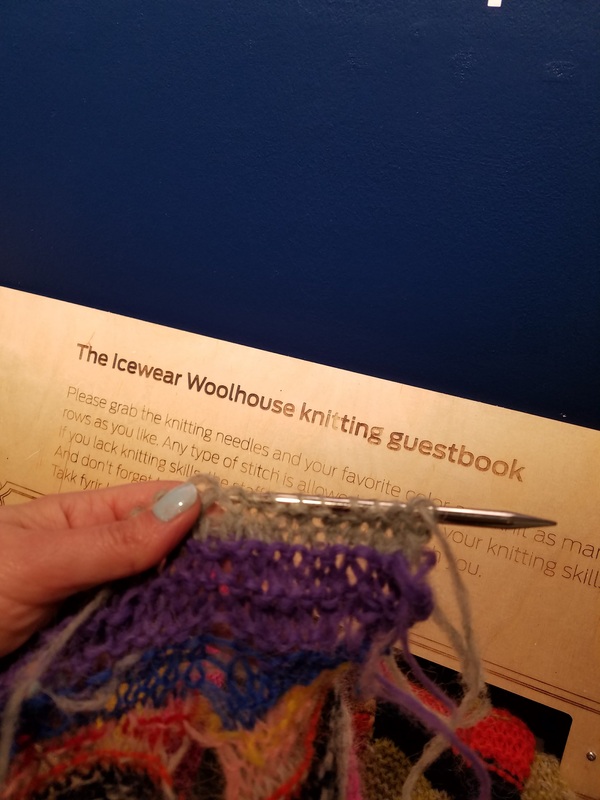 In one store, Ice Wear, there was a knitting guest log. A long scarf was tucked into a cubby in the wall, the instructions encouraged shoppers to knit a row if they know how, or to ask to learn. I am an avid knitter, just this year I knitted a total of 15 hats for my nieces and nephews for Christmas, as well as one for my Dad, my father in law, my friend Sean and my brother Kaz. At Ice Wear I knitted a few rows with the lime green color. 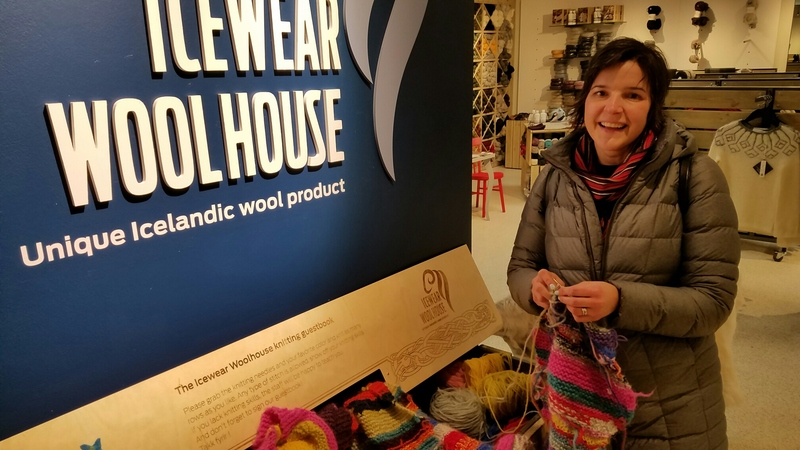 The woman working in the store, a Polish woman, brought out her knitting project and knitted along side of me for a bit. Then she helped me pick out a few balls of Icelandic wool in green so I could knit Todd a hat. With all the knitting I did this year, I still haven’t knitted him a hat. We headed back to the hotel to rest up for our second northern lights tour. Then got picked up by a coach bus for a ride into the northern part of the country to the Fontana spa. Here is another active geothermal hot spot, next to a power plant. We ate dinner and watched the very loud and very drunk British guys stumble around. It’s always a point of pride for me when the ugly American ends up not being American at all. The Fontana is situated above a hot spring, and the water is piped into several tubs of varying temperature. We wandered from tub to tub, trying out the various temperatures and trying to stay out of the drunken shenanigans. There was one area of the spring where the water is too hot to put into a tub. So instead they built a steam room over the top of it, where Todd and I sat and enjoyed the mildly sulphur smelling steam. That’s the thing about these hot springs. When we approached the geothermal energy plant, we could smell the rotten egg smell that comes from the sulphur. We didn’t smell it as we soaked in it, just in the air as we approached the plant. I am not sure if the water is filtered in some way to remove any odor, but lounging in these tubs was relaxing and pleasant smelling. As we sat in the tubs, the snow fell in cotton ball sized clumps again, and this time it was serious. The Icelanders cheered at the falling of snow, as they’d been looking forward to it and haven’t seen any due to the abnormally warm winter so far. The snow fell and collected on the ground. There’s no way we’d be seeing the northern lights this night either. And this was something that we didn’t get the chance to see the whole time we were in Iceland. On the plane on the way home I looked out the window frantically searching the sky for them. We’ll just have to go back, I suppose. Our hotel was right off the highway, which was super convenient as on both night tours we were the first to be dropped off. I had already dozed off in the bus, as the darkness and all the lounging in geothermal hot tubs had made me very sleepy. We fell right to sleep, in anticipation of the next morning: scuba diving in the Silfra Fissure. Read Day 4: Scuba Diving at Silfra here.